An old expression says that where there's a will, there's a way. In the natural world, however, it often seems to be the other way around. Where there's a way, nature invents the will. The fascinating plant called Indian Pipe is a great case in point. Indian Pipe is a 4-8 inch tall plant with a single pipe-shaped flower on each stalk. A similar and very closely related plant called Pinesap has multiple flowers on each stalk. Both Indian Pipe and Pinesap grow primarily in dense conifer forests, where few other plants can find enough light to survive. Indian Pipe probably received its name because Native Americans used the sap for medicinal purposes, including treatment of eye infections. Despite the mildly toxic nature of the raw plant, some people say that when cooked, Indian Pipe is edible and tastes something like asparagus. Other common names for the plant are Ghost Flower and Corpse Plant, references to the sickly grey-white color of the stalks, leaves, and flowers. Indian Pipe is white because it completely lacks chlorophyll, the green pigment so crucial to photosynthesis. Without chlorophyll, Indian Pipe can't produce energy and food as green plants do. So how does Indian Pipe survive? To understand that, you have to know about fungus and trees. Scientists have long thought that some fungi parasitize trees, stealing nutrients from tree roots. In the last couple of decades, however, the complex relationship between fungi and trees has become more clear ... and more interesting. Tiny threads of fungus, called hyphae, extend throughout the soil allowing the fungi to absorb minerals. They also intertwine and sometimes even enter tree roots, an association called a mycorrhiza. Through this association, the fungi pass minerals to the tree. In return, the trees pass sugars and other complex molecules to the fungi. The fungi exist as underground hyphae until conditions are right, when they quickly generate reproductive structures such as truffles underground, or mushrooms and puffballs aboveground. The relationship between fungi and trees allows each to focus on what it does best. Trees, with their enormous above ground surface area of leaves, gather energy from sunlight and use it to turn water and carbon dioxide into sugars and other carbohydrates. Fungi, with their dense underground network of hyphae, far smaller and more closely packed than even the tiniest of plant roots, can more efficiently harvest minerals from the soil. The relationship is so beneficial it has become almost universal. An estimated 90 percent of plants have mycorrhizal relationships with fungi. A single tree can support hundreds of different species of fungi entangled in its roots. This crucial relationship between fungi and trees makes a harmonious story of cooperation and mutual benefit. It also represents an opportunity to be exploited. Enter the Indian Pipe. An Indian Pipe plant exists for most of the year as a root mass under the ground that is covered with a dense mat of fungal hyphae. Like trees, Indian Pipe convinces the fungus to feed it minerals through the hyphae. Indian Pipe goes further. Somehow, it convinces the fungus to also give up sugars. Indian Pipe probably uses some of the same chemical cues trees and fungi use in their relationship. The unwitting hosts may be chemically duped into sharing with Indian Pipe. The ancestors of Indian Pipe were green plants in the same family as blueberry and rhododendron. They carried on photosynthesis and had relationships with fungi just like almost all other plants. But somewhere along the path of evolution, these plants figured out how to continue getting minerals from the fungi without giving anything back. And somewhere along the way, they figured out how to get the fungi to pass on sugars from trees. The ancestors of Indian Pipe no longer needed the complex and costly process of photosynthesis. Eventually, the genes used in photosynthesis were lost, including those for chlorophyll. That's why the plant isn't green at all, but a ghostly white. This also allowed the plants to grow in dark places such as deep forests, with very little competition for space. The fungi associated with Indian Pipe don't seem to do that. They seem to be perfectly happy to be parasitized. In fact, the fungus grows a nice dense mat on the Indian Pipe root mass. It's possible that fungi are getting something from Indian Pipe and we just don't know it. It's hard to imagine what that might be. Indian Pipe can't photosynthesize above ground, and below ground its roots are covered with fungi, so it doesn't seem that it has anything to share. Still some scientists think it's possible that Indian Pipe only seems parasitic because we don't know enough. After months, and even sometimes years, of gathering nutrients into its root system, an Indian Pipe plant may rather suddenly develop above ground, usually in August or September in our area. Within a few days, the root mass sends up a white stalk and then flowers. When the flowers have been pollinated by insects, the Indian Pipe plant releases tens of thousands of seeds, so tiny that each one consists of exactly ten cells. The seeds can be dispersed long distances by wind. Once they settle to the ground, they wait to be contacted by the hyphae of certain types of fungus. The fungus enters the seed, just as if it were infecting it, but then is coerced into providing all the nutrients the tiny seedling needs to grow. 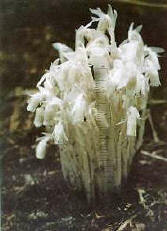 That's how the Indian Pipe can get away with creating large numbers of tiny seeds that have virtually no stored food. The seedlings just invite a fungus in and get it to provide food. The remarkable thing is that this kind of exploitation isn't all that remarkable. 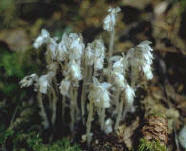 Worldwide, there are hundreds of other plants that parasitize fungi and trees the way Indian Pipe does. It's almost a sure thing that wherever you find an opportunity in the natural world, you'll find some animal or plant taking advantage of it. Where there's a way, there's a will.